Proudly serving our clients for a quarter century. Holland Investment Management (HIM) is a Fee-Based, Full-Discretion Registered Investment Advisor Firm established in February, 2004. Gary Holland formed Holland Investment Management (HIM) after spending the prior ten years at Smith Barney (now Morgan Stanley). Gary left Smith Barney because he did not believe the old "brokerage model" was an effective method of managing client investment portfolios. Instead, he wanted to manage client portfolios on a fee-based, full-discretion, fiduciary basis where client interests would always come first. At HIM, we believe the fee-based approach is best because the interests of both our clients and HIM are aligned. Both benefit from the growth of the client's investment portfolios and both are negatively impacted by the declines in the value of a client portfolio. Under the fee based system, we have no incentive to generate commissions or do any unnecessary trading. Our only goal is to grow our client's investment portfolios with the minimum drawdowns their risk tolerance will allow. We believe the full discretion model is far superior to the old brokerage model. In today's volatile markets, the old brokerage model of consulting the client before every decision could result in lost opportunities as there is simply not enough time to do that and still take advantage of opportunities. Full discretion enables HIM to effectively manage a client's portfolio during volatile markets. 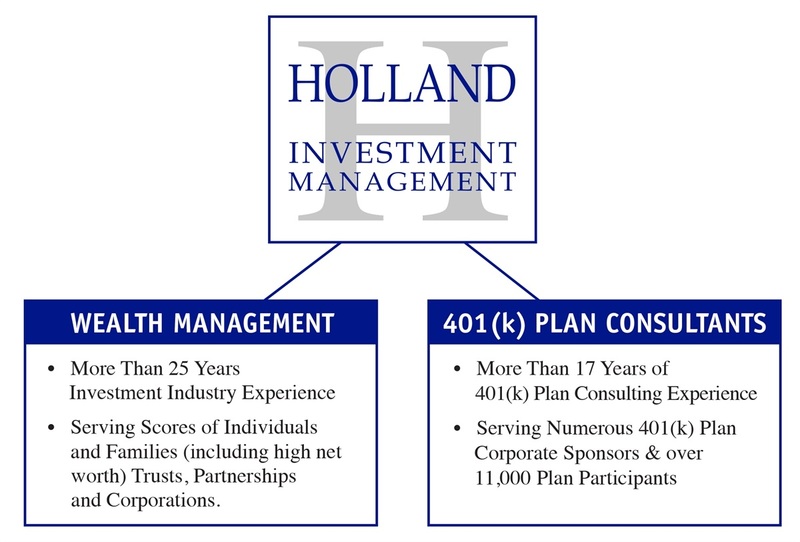 Holland Investment Management, Inc. (HIM) is a Registered Investment Adviser (RIA). HIM, as a fiduciary, always puts the interests of the client first in making decisions. Gary Holland and Charles Johnson are Investment Advisers and are required by the Investment Advisers Act of 1940 to act as fiduciaries for the advice they share with their clients. We are the only investment professionals legally allowed to call ourselves Investment Advisers. At HIM, we take the responsibility of managing our clients' life savings very seriously, and therefore we follow and study the markets 24/7, 365 days a year. HIM has access to research from all the big global asset managers. Additionally, we subscribe to numerous research publications to stay on top of markets. HIM offers 5 strategies for our clients based on their financial situation, investment timeframe and risk tolerance. Please see "Investment Portfolios" tab of our website for a more detailed explanation. For each holding, we assign a point score indicating the level of risk we feel the portfolio is being exposed to. Then we monitor the total amount of risk in each portfolio. This is done daily, weekly, and monthly, and updated when changes are made to the portfolio or changes occur in the investment environment. Changes ranging from Political, Geo-Political, Monetary and Fiscal Policy, Supply shocks, etc. Client assets are custodied at TD Ameritrade. TD Ameritrade has $1.2 Trillion in total client assets, more than 10,000 full-time employees, and 11.1 Million client accounts. TD Ameritrade Holding Corp. trades on the NASDAQ under the symbol AMTD.